the target residual content is the content that will achieve an equilibrium between the M-alk. and CaH in the water. for final pH adjustment to the pHs value; one then needs to use a saturator that delivers clear lime water while screening out lime impurities ; sodium hydroxide can be used as an alternative at this point. Aggressive CO2 can also be neutralised by filtration through a CaCO3 based granular neutralising product, according to the same reaction and implementing the same technology as for remineralisation using this process. Using this equation, one can calculate that, in order to increase mineralisation (M-alk. and CaH) by 1°F, 8.8 mg · L–1 of CO2 and 7.4 mg · L–1 of pure hydrated lime (or 5.6 mg · L–1 of pure quicklime) have to be injected into the water. Industrially, CO2 is supplied in cylinders under a very high pressure and more generally in cooled “low pressure” containers. In some industrial type installations, CO2 can be obtained by burning gas (submerged burners); however, the impurities generated by incomplete combustion and/or the original fuel, means that it cannot be used for drinking water production. When used in sea water processing, CO2 obtained by distilling sea water can be recycled and used to remineralise water intended for human consumption (e.g. Alba/Barhein, 43,000 m3·d–1, see figure 43). Depending on its origin, the purity of lime can vary from 80 to 95%; obviously, this factor has to be taken into account when calculating not only the amounts to be used but also the way in which the product is to be used. 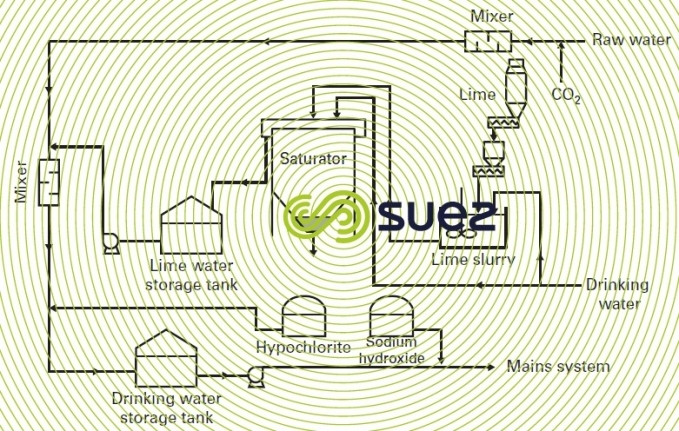 As an illustration, with a 90% “pure” product, if one wants to increase water hardness by 8°F, then 59.2 mg · L–1 of pure lime or approximately 65.8 mg · L–1 of commercial lime will have to be added and this will cause the water to be contaminated by 6.6 mg ·L–1 of suspended solids when the latter are not screened out in a saturator (see further on). satisfactory coagulation pH control will ensure that organic matter removal is optimised and that the standards applicable to residual dissolved coagulants (especially Aℓ) are more easily met. On the other hand, a certain number of processes occurring downstream from sedimentation may call for water with a higher pH (precipitation of Mn, biological nitrification of NH4+…). Therefore, one should consider remineralisation positioning: either upstream from the settling tank or between the settling tank and the filters. A flexible solution consists in anticipating two options by allowing the operator to select optimum conditions depending on raw water properties that will tend to change according to the season. 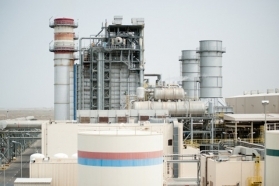 On this assumption, a minimum amount of CO2 will always be kept at the inlet in order to regulate the pH and a reagent (lime and CO2) and clarified water mixing point will be included upstream from the filters in order to ensure effective pH control and to prevent aluminium from re-dissolving. Contact time will vary according to temperature and to the lime slurry or water concentration (usually between 2 and 8 minutes). reagent flow rate: dispensing pump stability. Consequently, its use has traditionally been reserved to major surface water processing plants where clarification is compulsory and which, accordingly, have a higher level of instrumentation and inspection personnel. In order to increase TAC and TCa by 1°F, theoretically, therefore, one needs to use 4.4 mg · L–1 of CO2 and 10 mg · L–1 of CaCO3. The calcium carbonate routinely used in France is a special form with an interesting reactivity associated with its physical state: lithotamine (or maërl) is sold under different brand names including "Neutralite", "Neutralg", "Timalite"… It consists of coral type fossil algae debris (Lithothamniumcalcareum) and major deposits of this material can be found off the Brittany coast. Other forms of more or less finely crushed limestone can be used. However, the following contact times will need to be adjusted accordingly. The chemical composition of lithotamine does not vary much: it has a predominating proportion of calcium carbonate, 5% to 10% of magnesium carbonate and a few impurities. 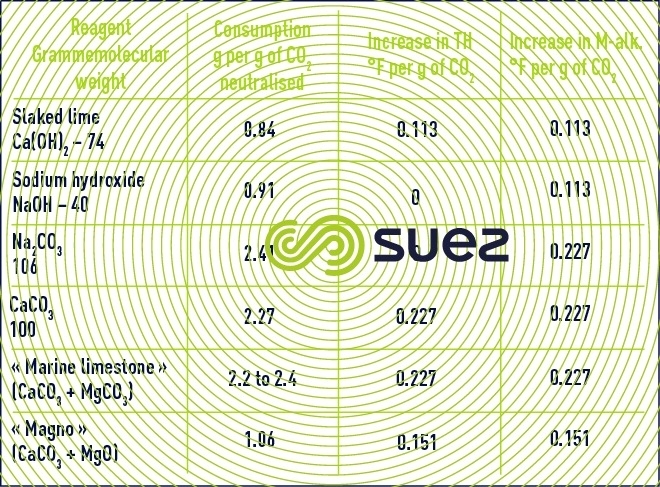 Depending on the CaCO3/MgCO3 ratio and on the % purity of the commercial product, marine limestone consumption can vary from 2.2 to 2.4 kg per kg of CO2 neutralised. More or less calcinated magnesium oxide based products have occasionally been proposed (CaCO3, CaO, MgO mixture). These products are more reactive and, therefore, require shorter contact times; however, the presence of available bases can lead to a pH > pHs and produce a highly scaling water, especially during prolonged shutdown periods or when the throughput falls below the normal throughput level. In such cases, an accurate check has to be undertaken. Powdered calcium carbonate can be used by injecting a suspension in water containing CO2 that requires neutralising; however, this method only applies to surface water that requires clarification and the use of a settling tank. 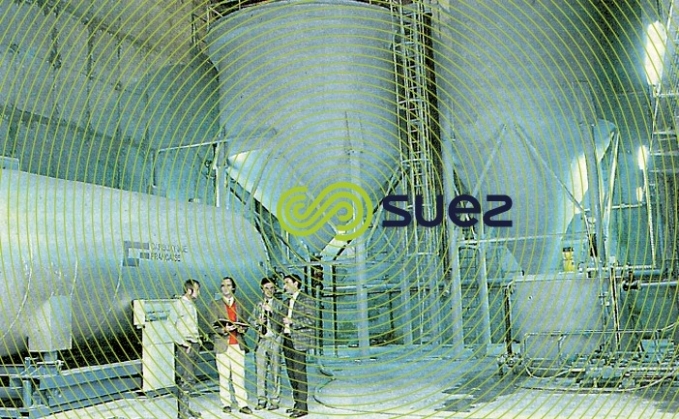 In these cases, a sludge blanket clarifier is particularly appropriate because it concentrates the suspension and allows for more prolonged contact times (30-45 minutes); furthermore, carbonate impurities help to "ballast" the floc, enhancing its settling properties. Figure 45 illustrates an example of the calculation charts available for dimensioning granulated marine limestone reagents (for a 1 to 2 mm particle size range). 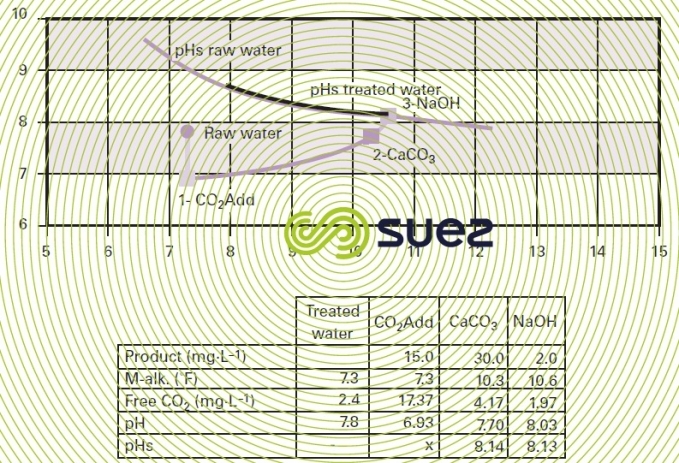 The amount of CO2 to be neutralised is established on the basis of raw water quality and target mineralisation and the graph provides the minimum contact time applicable. The result is expressed either as contact time (minutes) or as vol · vol–1·h–1. In practice, it is advisable to establish contact times experimentally in each case, given the wide range of parameters that have to be taken into account: temperature, the water’s M-alk., the contact method, the format of the medium (powder, granules etc) and, above all, the permissible CO2 residual value because it is extremely difficult, unless we use an infinite contact time, to obtain zero aggressive CO2 residue. In practice, knowing that the best that can be achieved is an equilibrium for 0.1 units of pH and whereas most technical specifications demand better than this (pH = pHs + 0.1 to 0.2), the recommended approach is to target a pH that is 0.2 to 0.3 units lower than the pHs at the filter outlet (thus leaving 1 to 2 mg · L–1 of aggressive CO­2) and then sodium hydroxide will be used to make the final pH adjustments (final neutralisation). The changes in the water's M-alk.-pH pair can be monitored using the "Calcograph" chart (please refer to figure 46 for an example). as the granules gradually dissolve, fines are formed and they tend to clog the material, requiring regular and effective backwashes (air + water washes). When limestone neutralisation is used, this can give rise to a deterioration of the bacteriological quality of the water produced (porous materials are easily colonised). 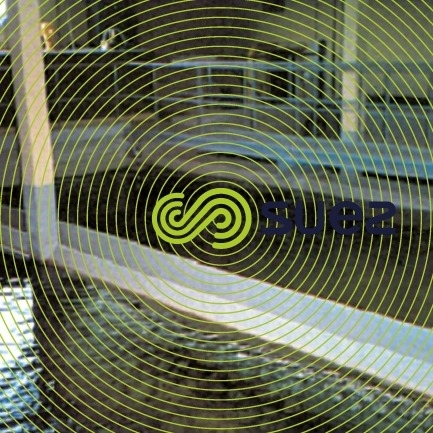 (if necessary) inject chlorine upstream from the reactors or when a backwash is being carried out. 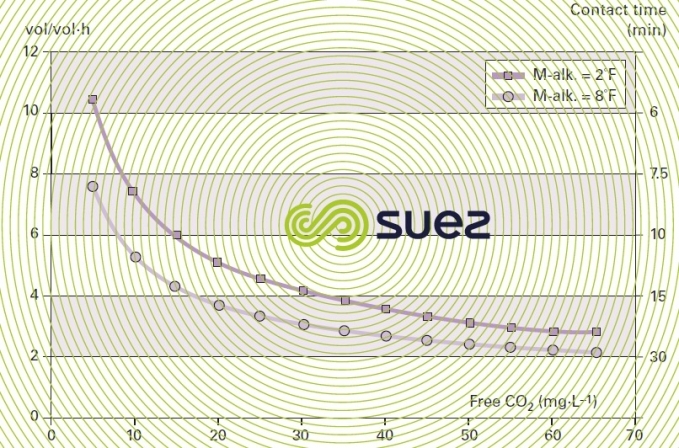 The "CO2–marine limestone" remineralisation system has a major advantage over the "CO2–lime" system: it is only conditional on the amount of CO2 (not always necessary) and there is no danger of any overdosing likely to create heavily scaling water. Therefore, it is particularly well suited to small units supplied with drilling water where the flow rate will often fluctuate. Drilling water will often contain dissolved metal ions (Fe2+, Mn2+) that may precipitate when in contact with the atmosphere and when the pH is raised. The hydroxides or oxides that are formed will block the pores of the medium and delay its dissolution. The same may apply to coloured water that is heavily loaded with humic acids: these may precipitate as metal compounds or as calcium salts that give rise to the same problems. In such cases, preliminary iron or manganese removal processing using the physical-chemical or biological method (see sections Iron removal and manganese removal), or humic acid coagulation with an iron salt followed by a minimum of sand filtration, will be required before proceeding with remineralisation. Table 12 presents the consumption of various reagents deemed pure together with their mineralisation action on water.